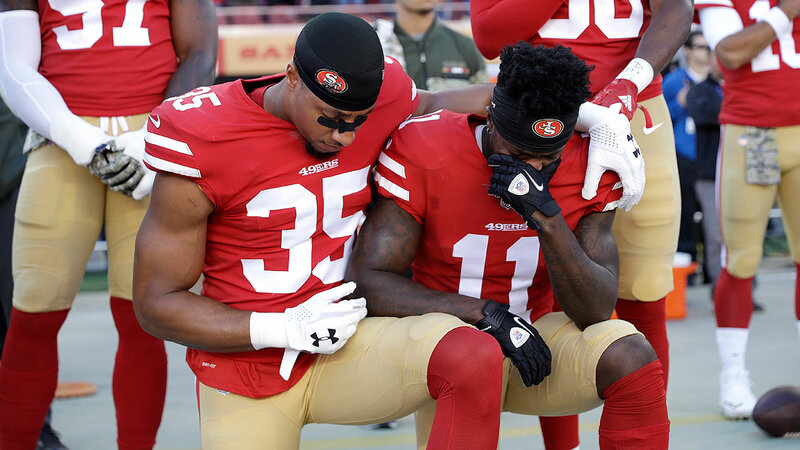 San Francisco 49ers safety Eric Reid (35) and receiver Marquise Goodwin (11) kneel during the performance of the national anthem in Santa Clara, Calif., Sunday, Nov. 12, 2017. SANTA CLARA, Calif. -- The San Francisco 49ers' first win of the season came with a touching and heartbreaking moment. Wide receiver Marquise Goodwin scored a touchdown Sunday, helping lead his team to victory. Just hours earlier, Goodwin and his wife Morgan lost their newborn son. San Francisco 49ers wide receiver Marquise Goodwin (11) catches a touchdown pass in front of New York Giants cornerback Janoris Jenkins (20). While Goodwin provided one of the biggest highlights of the 49ers season, he was mourning the loss of his newborn son. Goodwin knelt in the end zone, and then dropped to both knees after running in the 83-yard touchdown. The wide receiver then fell into his hands as his teammates gathered around him. After the game, Goodwin posted on Instagram that his son died after being born prematurely early Sunday morning. He wrote, "Unfortunately we lost our baby boy due to some complications, and had to prematurely deliver him early this morning around 4am. Although we are hurt, I am grateful for the experience and grateful that God blessed me with a wife as courageous and resilient as Morgan. The pain (physically, mentally, & emotionally) that she has endured is unbelievable. Please Pray for the Goodwin family."